Chandigarh:The country’s largest luxury car manufacturer Mercedes-Benz, launched the flagship luxury model, the S-Class‘Connoisseur’s Edition’ for its discerning customers today. This is the 4th launch for the year from the German luxury car manufacturer this year. Popularly referred to as the ‘best car in the world’ by the critics and patrons, the S-Class portfolio in India is a benchmark to be reckoned with. The flagship S-Class epitomizes opulence, indulgence and automotive magnificence. 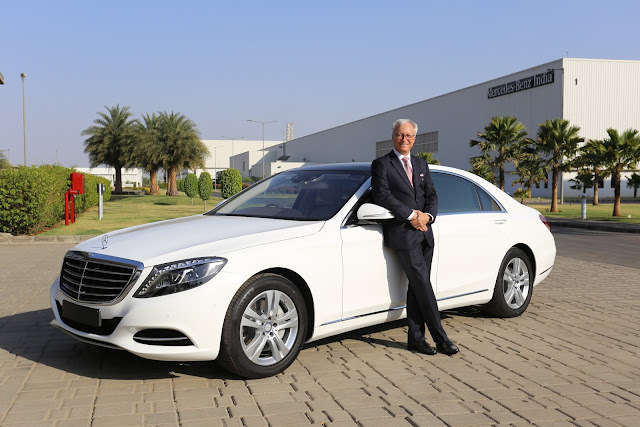 In an ongoing effort to improve its products, Mercedes-Benz has also been focusing on the needs of its chauffeur driven customers in India. Mercedes-Benz has been providing an immersive and personalized rear seat experience; given more customers increasingly tend to spend more time in their cars.With the launch of the ‘Connoisseur’s Edition’S-Class, Mercedes-Benz reiterates its brand promise of the ‘best or nothing’. 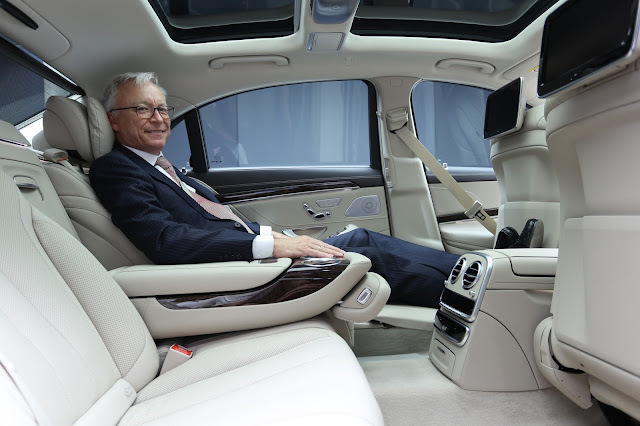 The S-Class ‘Connoisseur’s Edition’was launched by Roland Folger, Managing Director and CEO, Mercedes-Benz India. within high-beam head lamp range is shown as a crystal-clear greyscale image. A thermal imaging camera in the radiator grille is able to give a precise warning by distinguishing between irrelevant objects such as traffic sign combinations or bushes and relevant objects such as pedestrians or large animals.The spotlight function enables endangered pedestrians to be flashed at several times, so that the driver registers them even more quickly and the former recognize the danger. As standard, the night view image only appears automatically when a hazardous situation is recognized. With the Executive seat including the extended thigh support, the rear passenger on the front passenger side is able to enjoy even long journeys in complete relaxation. The seat can be brought into a comfortable reclined position of up to 43.5 degrees at the touch of a button. The additional extending thigh support provides for further enhanced comfort. This, in combination with the chauffer package provides an electrically extending footrest and creates the perfect reclined position for a comfortable refreshing sleep. A cushion bag improves occupant protection when the seat backrest is heavily reclined. In the event of a frontal collision, the cushion bag deploys under the seat cushion and prevents the occupant from sliding beneath the seat belt (submarining). The vehicle interior can be fragranced to suit personal preference with the AIR-BALANCE package. In addition, the air quality can be improved by ionization and optimized filtering of the incoming and recirculating air. There is a choice of six high-quality interior fragrances according to personal preference. The fragrance can be easily changed by exchanging the fragrance flasks used in the generator in the glove compartment. The intensity and duration of the fragrance are adjustable. Oxygen ionisation of the interior air is a further function of the AIR-BALANCE package. Enriching the air with negatively charged oxygen ions has a refreshing effect. The S 350d is equipped with first-class Burmester® feel-good sound delivered by 13 high-performance speakers and electronic and acoustic components precisely tailored to the interior. The surround function and the sound optimization for the front and rear seats provide an even more intensive listening experience. The S 400 offers the high performance Burmester 3D surround sound system with 24 speakers, nine tweeters integrated in the instrument panels, doors, parcel shelf and roof lining along with the 24 channel amplifier with an output of 1520 watts, presenting an incredible and unmatched listening pleasure. The S-Class offers a rejuvenating hot stone massage function with six different programs ranging from relaxing and stimulating to an energizing effect. Occupants can choose from two intensities – low and high, and the seat backrest comes with a massage mat with 14 air chambers which can be inflated or deflated via fast responding solenoidvalves, developing a wave-like hot stone massage effect. The massage function can be operated via remote with durations ranging from 12– 15 minutes. For customers and automotive experts alike, the S-Class has long been the yardstick for advanced engineering and luxury motoring. The innovative safety systems featured in the new S-Class is the most advanced and includes 8 airbags, Electronic Stability Program(ESP), PRE-SAFE, Dynamic cornering control system, Adaptive Brake with HOLD Function, Brake Assist, ASR Hill Start Assist, 360 Degree Surround View Camera and an Active Park Assist. Established in 1994, Mercedes-Benz India Pvt. Ltd. pioneered the luxury car market in India and boasts of more than 130 years of cutting edge innovation in the luxury automobile industry globally. Set up in 2009, Mercedes-Benz India’s world class production facility is spread over 100 acres in Chakan near Pune. Since June 2015, Mercedes-Benz India also commenced production from its new expanded production facility located in the same premises. The production facility now carries an investment of INR 1000+ crores and has the largest installed production capacity for any luxury carmaker in India. Mercedes-Benz India product portfolio comprises the locally produced Mercedes Maybach S 500, S-Class, E-Class, C-Class, CLA luxury sedans and the GLA, GLE and the GLS luxury SUVs. The CKD GLC was the 9th product added to Mercedes-Benz’s local production portfolio. Completely Built imported cars portfolio includes the A-Class, B-Class, CLS, E-Class Cabriolet, S-Class Coupé, C-Class Cabriolet, S-Class Cabriolet and the S 600 Guard a range of other Guard vehicles etc. The product portfolio also comprises the iconic off-roader Mercedes-AMG G 63 as well as a wide range of other Mercedes-AMG performance cars like the AMG CLA 45,AMG C 63 S, AMG S 63 Coupe, AMG S 63 Sedan, AMG GLA 45, AMG GLE 43 Coupe, AMG GT S sports car, AMG SLC 43 and AMG C 43. The long wheel base version of the new E-Class is Made in India, for India, the first new generation car to be locally produced since market launch. India is the first country to get an RHD version of the LWB E-Class in the world. Mercedes-Benz India also has the largest network spread amongst any luxury carmaker, with presence in 41 Indian cities through 89 outlets. Through the exclusive AMG Performance Centres located in 5 metros including Delhi, Mumbai, Hyderabad, Bangalore and Pune; the AMG performance sub-brand of Mercedes-Benz also boasts of a strong retail network presence in the country. Mercedes-Benz India registered annual sale of 13,231 units in the January–December 2016 period facing multiple market challenges. In 2017, ‘One Team, One Goal’ will be Mercedes-Benz’s philosophy, towards achieving best customer experience. The company will have fascinating product introductions, innovative luxury retail experience, value driven finance programmes and innovative after-sales service experiences. With ‘One Team, One Goal’ philosophy, Mercedes-Benz India will continue the ‘winning’ momentum it has created for itself in the diverse Indian market.